Are you at home with small children? 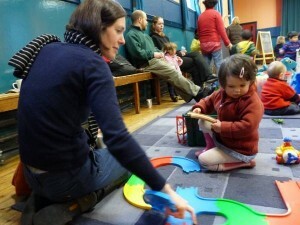 Come along to our friendly toddler group from 9.30am-11.30am on a Monday and a Thursday. Mums, dads, grannies, grandads and nannies are all welcome! For busy Mums, we also offer a workspace with laptops for some guilt-free time to work on job applications, university assignments and so forth while the children play. Using Wi-fi, the workstation consists of 4 laptops with detachable tablet keyboards to enable busy mums to complete job applications, research, uni assignments and so forth during our toddler groups, a guilt-free workspace in an environment where the children are happy and there is the support of other parents, grandparents and nannies, as well as a PVG cleared member of St Peter’s staff. It’s a bit of a pilot project initially, so we may feel the need to adjust things or to call for some volunteers to help with kids if there is a lot of interest in utilising the workspace. As of now, it is simply St Peter’s way of offering a little extra support to the brilliant mums in our community, many of whom are overloaded with study commitments or trying to re-enter the paid workforce. Tea and fresh coffee also available, along with healthy snacks for the little ones.